Arkansas, a south central agricultural state, bounded on the east by the Mississippi River. The total area of the state is 53,179 square miles (137,002 km²), with a population estimated in 2008 at 2,855,390. In 2000 82.65% of the population were White and 16.02% were African American. The following figures represent the religious affiliations of people in Arkansas: Baptist: 39%; Methodist: 9%; Pentecostal: 6%; Church of Christ: 6%; Assemblies of God: 3%; Other Protestant: 15%; Roman Catholic: 7%; Orthodox Christian: under 1%; Mormon/LDS: under 0.5%; Other Christian: under 1%; Other religions: under 1%; and Non-religious: 14%. The largest denomination is the Southern Baptist Convention. Amish Mennonites settled near Stuttgart in the east central part of the state in the decade of the 1880s but by 1920 the settlement had become extinct. A new wave of Amish Mennonite migration began in 1925 but in approximately a decade this settlement too had ceased to exist. In 1883 a small group of Mennonites from Henry County, Iowa, located a short distance north of Stuttgart near Fairmount and organized a Mennonite Brethren in Christ Church. By 1891 the congregation had approximately 50 members but the church was discontinued in 1899. From 1927 to 1937 there was an Old Order Amish community north of Stuttgart. By 1988, there were 16 Mennonite congregations in the state belonging to the following six conferences (number of congregations and membership in parentheses): Beachy Amish Mennonite Fellowship (2, 42); Conservative Mennonite Conference (1, 29); South Central Conference (MC, 3, 44 plus one church planting effort); unaffiliated Mennonite congregations (6, 147); Church of God in Christ Mennonite (1 congregation); Mennonite Brethren (3 congregations). Two congregations belonged to more than one conference. There was one Amish settlement (one congregation) in White County Mennonites sponsored a 26-bed hospital and outpatient clinic at Calico Rock, one skilled nursing facility (108 beds) at El Dorado, and one nursing home (67 beds) at Harrison. Horsch, James E., ed. Mennonite Yearbook and Directory (1988-89):18-19, 51, 78-79, 98-99, 121, 126, 127, 167-168. Luthy, David. Amish Settlements Across America. Aylmer, ON: Pathway, 1985: 7. Gingerich, Melvin, Reynold Sawatzky and Richard D. Thiessen. 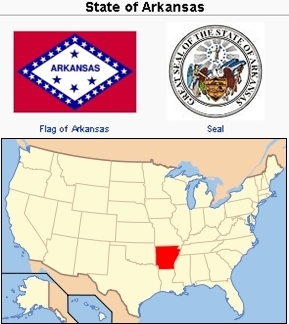 "Arkansas (USA)." Global Anabaptist Mennonite Encyclopedia Online. February 2009. Web. 23 Apr 2019. http://gameo.org/index.php?title=Arkansas_(USA)&oldid=144743. Gingerich, Melvin, Reynold Sawatzky and Richard D. Thiessen. (February 2009). Arkansas (USA). Global Anabaptist Mennonite Encyclopedia Online. Retrieved 23 April 2019, from http://gameo.org/index.php?title=Arkansas_(USA)&oldid=144743. Adapted by permission of Herald Press, Harrisonburg, Virginia, from Mennonite Encyclopedia, Vol. 1, p. 158; vol. 5, p. 37. All rights reserved.